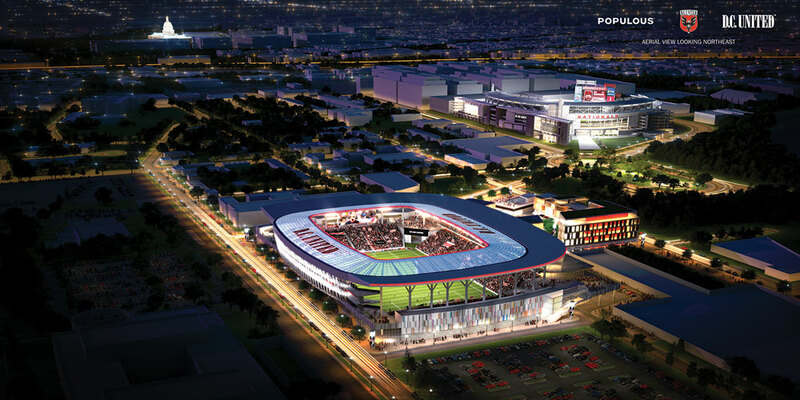 Last July, plans were announced to build a new soccer stadium for D.C. United. The stadium is set to open in 2016 at Buzzards Point just blocks away from Nationals Park. Along with the announcement came artist renderings of what the potential stadium and surrounding area would look like when it was completed. The stadium is expected to seat anywhere from 20,000-25,000 fans. Today, the team unveiled updated images of what they envision the state-of-the-art soccer stadium would look like. And boy does it look marvelous. Take a look. 2014 rendering. Image via D.C. United.